Happy new year fighters, supporters and beautiful souls. I spent pretty much all of today responding to the beautiful and kind email messages and comments from all of you and I spent a lot of time being part of our online fighter support group chats. There is no other way that I would have liked to spend the first day of 2014. I spent all day being inspired, uplifted, touched and moved by not only reading such kind words, but by being surrounded (well, virtually surrounded via internet) with such strong people. We truly have a special community on this blog, and I want to thank everyone who is part of it. My plan today was to wake up, go to the gym (now that I am feeling better), and that was pretty much it. Instead, I woke up, ate breakfast, took a nap, answered my emails, took another nap,ate lunch,and now am about to go watch a movie with my grandma and my sister. So much for plans, right? And so much for Ed’s plan at that. I guess the gym just didn’t have a place on the first day of my new year today, and I am actually really feeling OK with that. I was all excited that the “holiday food season” was over after New Years and I could get back in my routine today, but like always, I have learned yet again to not plan every part of my life. The holiday food season might be over, but the days of lazy days in bed and movies with my family are thankfully not over. Another fighter had asked me what my new years resolution was, and up until she asked me, I really didn’t think about it. I have never been one to make new years resolutions, and if I did, they were Ed’s resolutions, not mine. And right after I read that, my aunt sent me this picture. It couldn’t have been better timing. Essentially, I have been working on this resolution since I started recovery, and so instead of set a new goal for myself, I have decided to keep working towards my goal from 2013. I think I will work on this resolution far past 2014 and 2015 and 2020, and as long as I can say I am working to still love myself more, Ed is not winning. I will love myself more through my hard days, through my body checks, and through my sometimes negative self talk. I will love myself through my body changing, through my good and bad moods, and through my hard days of recovery. I will love myself more on my easier days, my peaceful days and my quiet days, and try harder to not be upset with myself and think that because I had an easy day, I must not be trying hard enough. 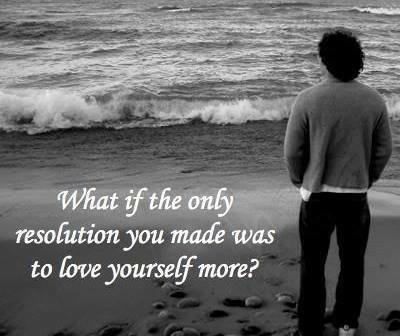 I will continue to work on loving myself through the last 20 days of this one year journey that we have left together. I will have loved myself more in these past 365 days of this blog than I ever have before.